The divisions are unfortunate because there’s really a place for a middle ground: reasonably priced, unintimidating neighborhood places that serve a variety of cooked and raw foods, some authentic and some that would be barely recognizable in Japan, but all well-prepared. 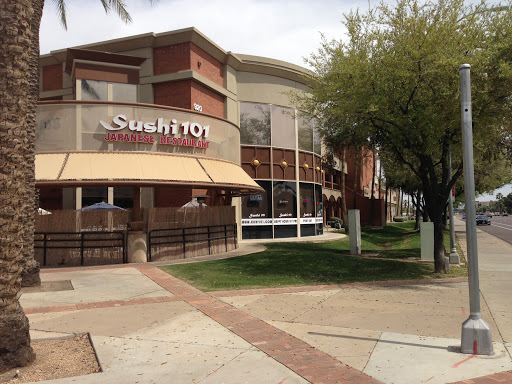 If there is to be a middle ground, Sushi 101, located in Tempe’s Cornerstone development diagonally across from the University / Rural light rail station, might be a candidate for inclusion. 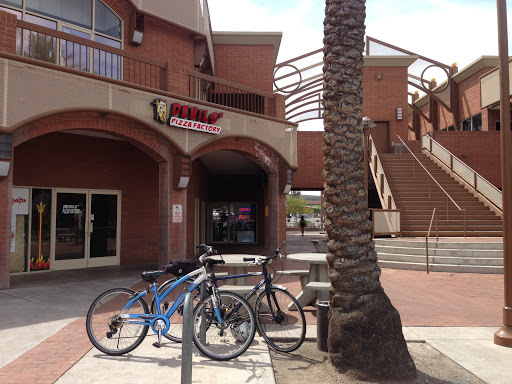 The name is an obvious reference to the restaurant’s proximity to ASU’s main campus. The restaurant has two entrances — one at the rear of the building facing the parking lot, which is thankfully hidden from the street, and another along a passage that connects that parking lot to the busy corner of University and Rural. Bike racks are near both doors. Inside, there’s a bar that’s active only a night, a dining room with a door to an adjacent patio, and a semi-circular sushi bar, which is probably the best place to sit if you’d like to sample delicacies such as Yellowtail kama, the bony neck meat of the amberjack fish. If you’d like to skip such exotic items and instead use chopsticks to eat cream-cheese filled rolls after dunking them in a muddy melange of soy sauce and faux wasabi, Sushi 101 is happy to accommodate. On the other hand, if you’d prefer to focus on sashimi and nigiri, upgrade to real wasabi for $2.50 more, and eat the sushi with your hands, then Sushi 101 is also happy to pat you on the back for stepping up to a higher level. To experience the best the restaurant has to offer, make sure to check the boards near the sushi bar for what’s new or fresh. Before proceeding to the sushi, sashimi, or cooked entrees, however, you may want to sample a few starters from either the regular menu or the separate sushi menu. 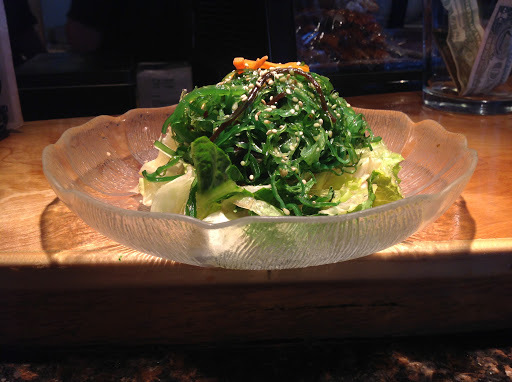 Light choices that leave plenty of room for the main course include miso soup and seaweed salad. Heartier appetizers include pan-fried gyoza with a pork-and-vegetable filling and spring rolls with a meatless mix inside rice paper. In a riff on the traditional bowl of boiled soybeans, Sushi 101 offers not only traditional edamame, adorned only with salt, but also a spicy garlic version with herbs and olive oil. Order sushi and sashimi a la carte, and the bill can climb rapidly. The best values may be the lunch combinations. These come with an assortment of crowd-pleasing nigiri: salmon, tuna, and whitefish. Those are all solid choices: supple in texture, ever-so slightly briny but not overly fishy, and served on nicely packed beds of rice. 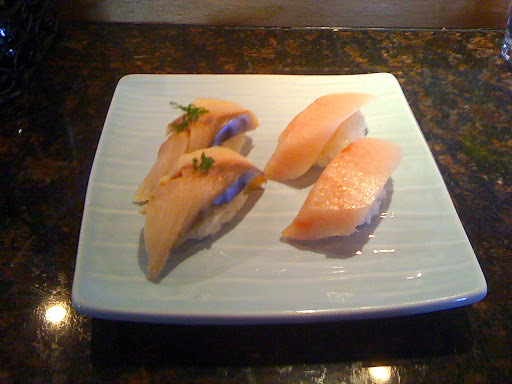 For a bolder taste, try the mackerel or yellowtail. 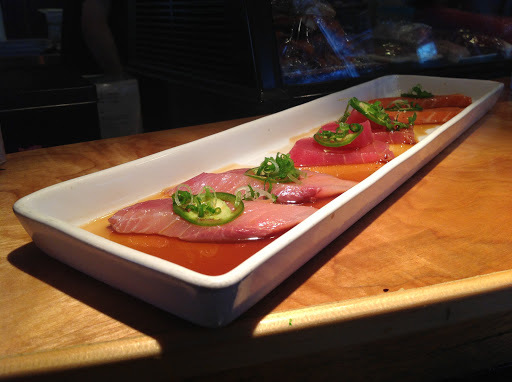 The “101 Karapaccio” is a sashimi assortment with two pieces each of salmon, tuna, and yellowtail, sparingly topped with a splash of ponzu, a slice of jalapeno, and a sprinkling of sliced scallions. 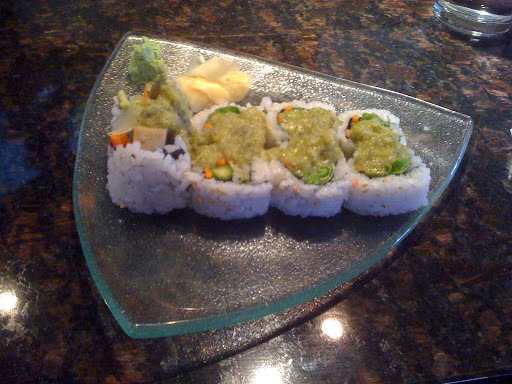 Of course, Sushi 101 offers a long list of rolls, including a weekly special announced on the restaurant’s Web site. The roll of the week is usually a creative one with a name like “Godzilla” and ingredients like imitation crab, avocado, and cream cheese to make purists cringe. The “Monkey Brain” probably is the most radical departure from tradition with mozzarella, tuna, krab, and seaweed combined and then fried. Most of these concoctions are actually pretty good to anyone willing to approach them with an open mind, but they can also be quite filling. Cooked food on the menu includes all the usual suspects: teriyaki, tempura, noodles, etc. The tempura vegetables are crisp and not burdened by excessive oiliness. 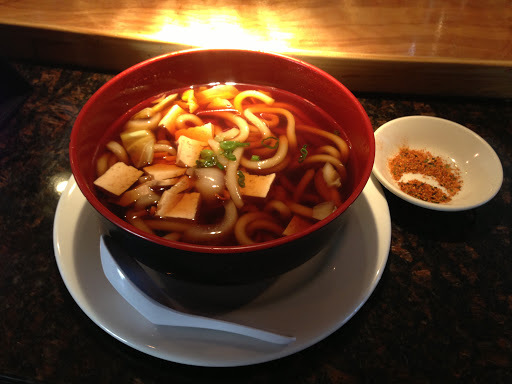 Udon comes in three varieties, including versions with tempura, seafood and tofu, and a meatless choice. The broth is rich, and the garnish of shichimi togarashi, the red seven-spice mixture, adds additional flavor for those who seek it. 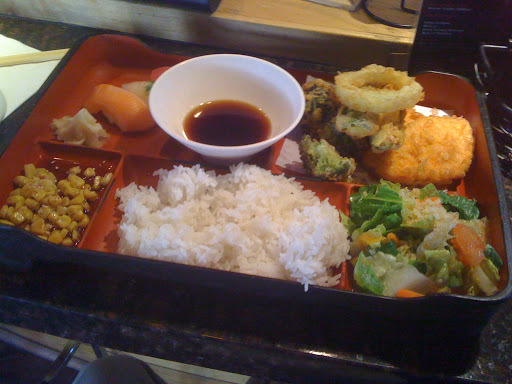 As with the sushi, the best bargains are found at midday via the lunch bento specials, each of which features a variety of cooked items in a traditional boxed presentation. Beverages offerings comprise a selection of wine and beer, including perennial sushi bar favorites Kirin Ichiban on draft and Sapporo in big 22-ounce bottles. The mixed drinks have lengthy ingredient lists and names such as “Miso Hungry” and “Have a Rice Day” that rival the sushi rolls in terms of contrived creativity. Non-alcoholic drinks choices are fountain sodas, iced black or green tea, and fruit juices. There’s a dessert section including fairly predictable choices such as green tea ice cream and mochi balls in red bean or chocolate varieties. Not everyone likes sushi, and not every sushi aficionado will appreciate Sushi 101’s catering to the college crowd. 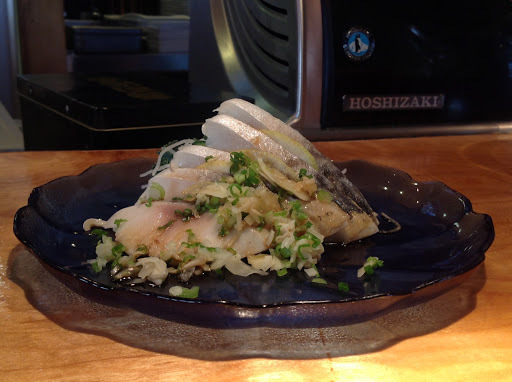 Regardless, the restaurant gets the basics right in terms of fish and rice quality, and pairs those fundamentals with efficient, friendly service and a menu broad enough to address the inevitable member of any large dining party who just isn’t going to eat raw fish. Sit in any of those environments, order what you like, and enjoy a meal without the pressure to join any particular faction in the sometimes fragmented world of sushi. I loooove Sushi 101, likely for nostalgic reasons mostly, but they really do have decent, fresh sushi. My husband and I went on a lot of dates at Sushi 101 before we got hitched and it remains a favorite "date spot" despite the high volume of youngin's (being even 3 years removed from college is weird). The atmosphere is nice, you can get an inexpensive sake bomb at happy hour, and staff is quick. I've never been disappointed here!